EQUIPMENT_COMPANY | Immanuel Industrial Co., Ltd. Acrylic housewares and bathroom accessories professional manufacturer. Microcomputer control system provide 4-step injection control with adjustable pressure/speed and 3-step holding pressure to meet most complicated molding requirements. Heat transfer printing is the process of applying heat-applied materials to various items with a heat press. The heat transfer printer is designed with a cylindrical transfer wheel and works at a steady and adjustable speed rate. It efficiently adds colors to the products. Hot stamp printing is a dry printing method of lithography in which pre-dried ink or foils are transferred to a surface at high temperature. Hot stamp printers make it an easy and fast job to replace the foil rolls and hot stamp printing is often used on display bottles , perfume containers, ice buckets and so on. Pad printing is a printing process that can transfer a 2-D image to a 3-D object. The unique properties of the silicone pad enable it to pick the image up from a flat plane and transfer to a variety of surfaces such as flat, cylindrical, spherical, compound angles, textures or convex surfaces. Ultraviolet drying is a photochemical process in which high-intensity of ultraviolet light is used to instantly cure or dry inks, coatings or adhesives. UV drying has been shown to increase production speed, reduce reject rates, improve scratches and solvent resistance and facilitate superior bonding. UV drying technique is mostly used for tailor-made products. Ultrasonic welding is an industrial technique whereby high-frequency ultrasonic acoustic vibration are locally applied to workpieces being held together under pressure to create a solid-state weld. It is commonly used for plastics. This machine is used to weld the rim or necks of bottles in the processing. It prevents the bottles from leaking and meanwhile creates aesthetic functions. Many manual dispensing operations can be economically automated by dispensing robots, which save costs in materials, time and labor. 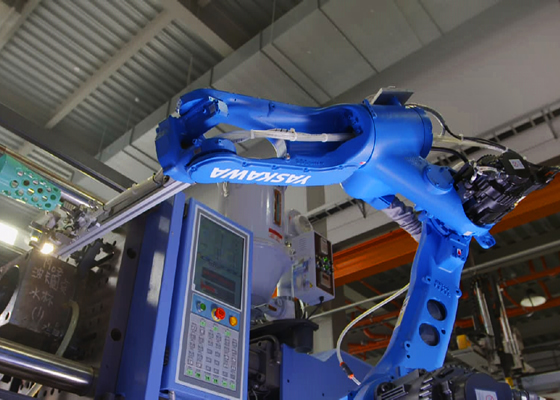 Dispensing robots can control the precise time, pressure and quality of dispensing glues. They are wonderful helpers in the production of diversified products.